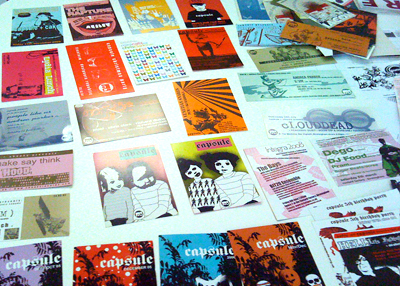 Capsule archive – what have you got? So folks as you know by now Capsule will be celebrating our 10th birthday in December and as part of a month long celebration we’re moving into Vivid, an art space in Digbeth. Not only will we be hosting a series of live shows with the likes of Lightning Bolt, Monotonix and Beak> alongside some of our favourite Brummies – we’re also producing an exhibition which delves deep into our archive. 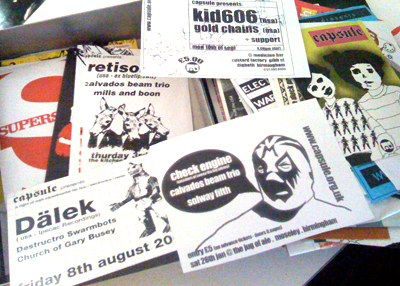 This will feature 10 years worth of flyers, photos and related ephemera. Which comes onto our call out – if you have any photos from past shows or video footage, sound recordings, related stories, memories, reviews, blog posts please get in touch – all contributions will be included in our exhibition. or if you have a comment/story or memory of fav show to add you can leave something in the comments on this blog post. 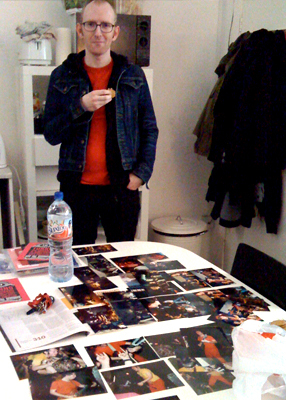 Matt Snowden aka one half of Esquilax and the brains behind the Dream Dreams The Dreamer Orkestra popped by last week with a box full of treasures which included loads of old Capsule flyers and photos he’d taken at past gigs. It sure brought back a load of good memories for us. 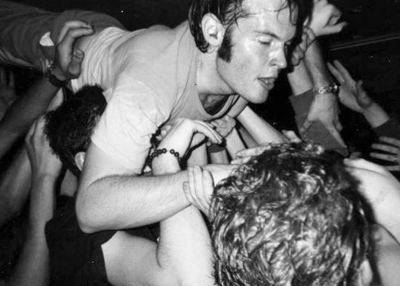 This photo was taken at an Oxes show in 2001 at the Jug Of Ale – it was a rather sweaty & raucous night to say the least. Here is one of Lightning Bolt from 2004 when they played in what is now the theatre space at the Custard Factory – again this was one of those unforgettable shows. 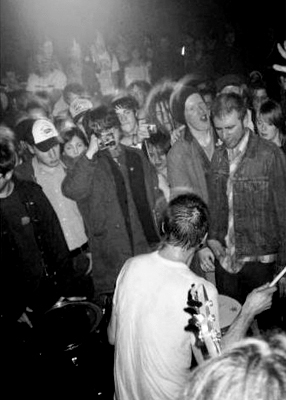 “Sat at home on a Monday night 6 years ago I got a call recommending that I come to the Custard Factory to see this band that I had not heard of and an hour later I was in the most amazing sonic maelstrom. This was the first time I saw Lightning Bolt. It was the best chance i ever took….. Dig deep and hunt out those old photos or just send us a comment – all contributions gratefully received – there may even be prizes!! !